Located just behind the shopping center Lewisham model market makes use of an abandoned shopping arcade every Friday and Saturday during the summer. The line up changes regularly but luckily for me most of the favourites seem to be there every week. With around 15-20 stalls we were spoilt for choice with everything from Asian street food to burgers and desserts. There's also a bar and lounge area upstairs where you can enjoy dinner and drinks overlooking the market. 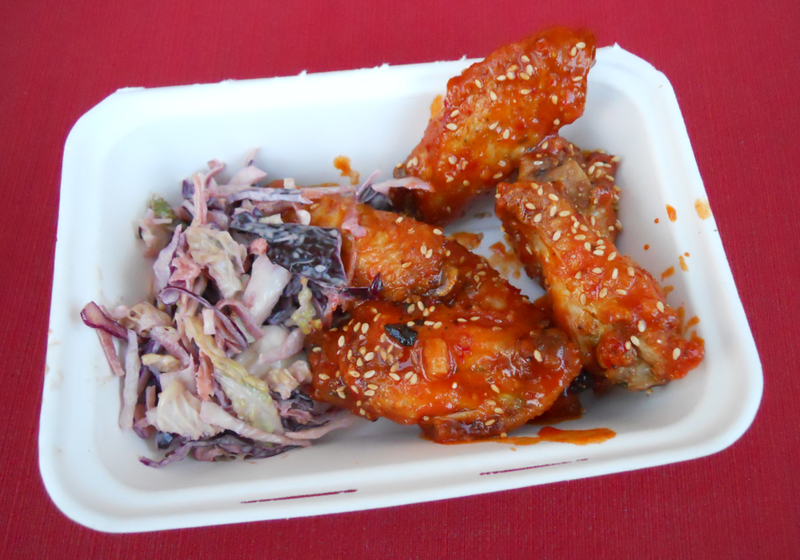 We started with these Korean chicken wings from Spit and Roast which were so good we ended up going back for more. Crispy bite sized wings coated in the most amazing sticky chilli sauce. Deliciously moreish and definitely a dish that I would recommend. 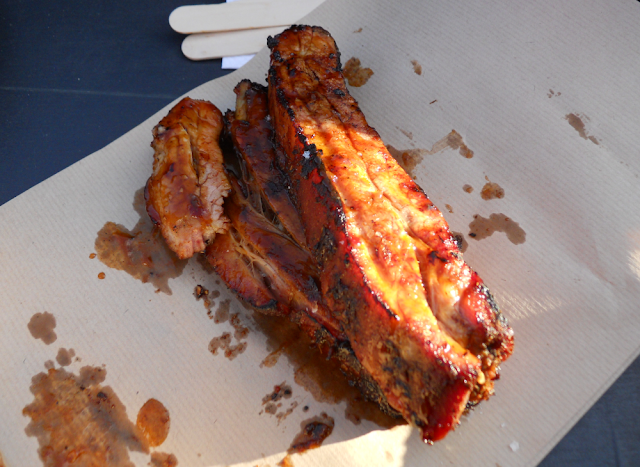 Next came these giant ribs from Smoke House. Cooked over a flame grill and smothered in BBQ sauce these were ridiculously messy to eat but oh my goodness were they good! Juicy tender pork that went perfectly with the sweet smokey sauce. 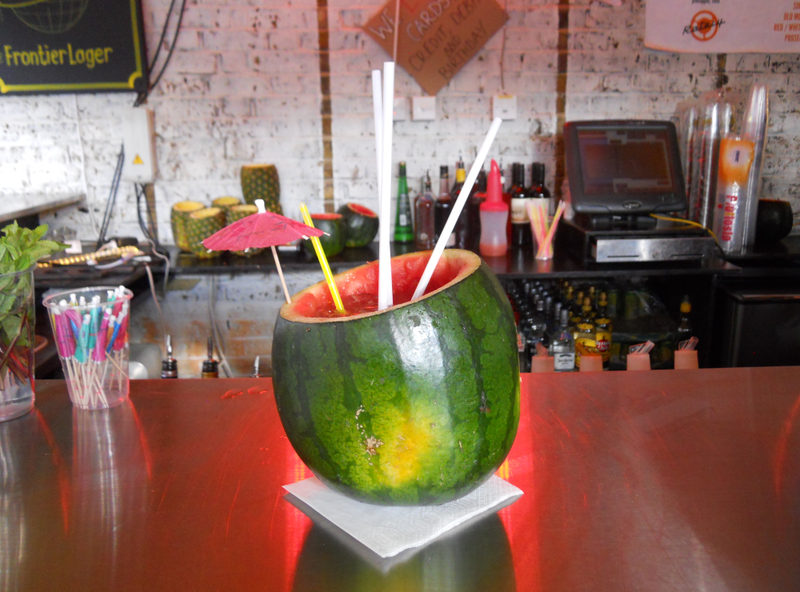 After a few dishes we were in need of some hydration and what better than a refreshing cocktail served in an hallowed out watermelon. Very Instagramable and a fun way to share a drink. 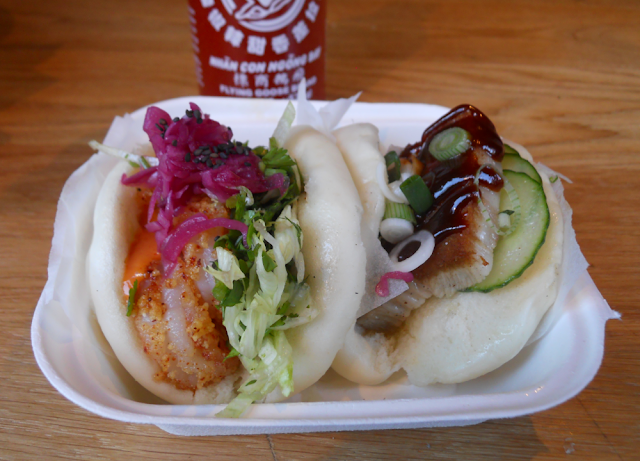 Yum Bun was another favourite and both the scrimp and pork belly were absolutely delicious. Salty meat and flavoured mayonnaise/hoisin sauce wrapped in the lightest fluffiest bun. In fact we enjoyed these so much we went back for another 2 servings. I have Gemma to thank for the last savoury dish of the day. The double candy bacon flipper from Mother Flipper (above in the first photo). A juicy beef patty in a brioche bun with melted American cheese, pickles and candied bacon. The whole thing was so well flavoured and the crispy bacon absolutely delicious too. I've never had it with maple syrup before but it's definitely something that I'll be recreating at home. There were a few options for dessert too. 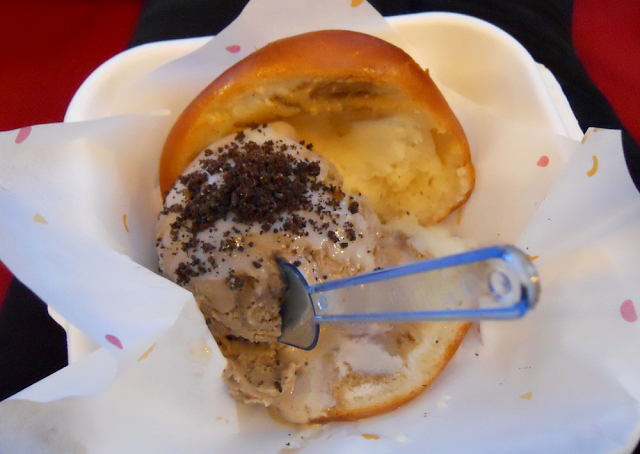 I'd planned to try some brownies from SE bakery or a Meringue girls sundae but in the end I couldn't resist this ice cream from my favourite Yum Bun. I loved the combination of cold coffee ice cream and warm toasted brioche bun and it was the perfect end to our meal. Lewisham model market has a fun chilled out urban vibe and as the night goes on it gets packed with full of people all out to have a good time and enjoy the food and atmosphere on offer. It's on all summer and if you're ever in the area then I would definitely recommend a visit. 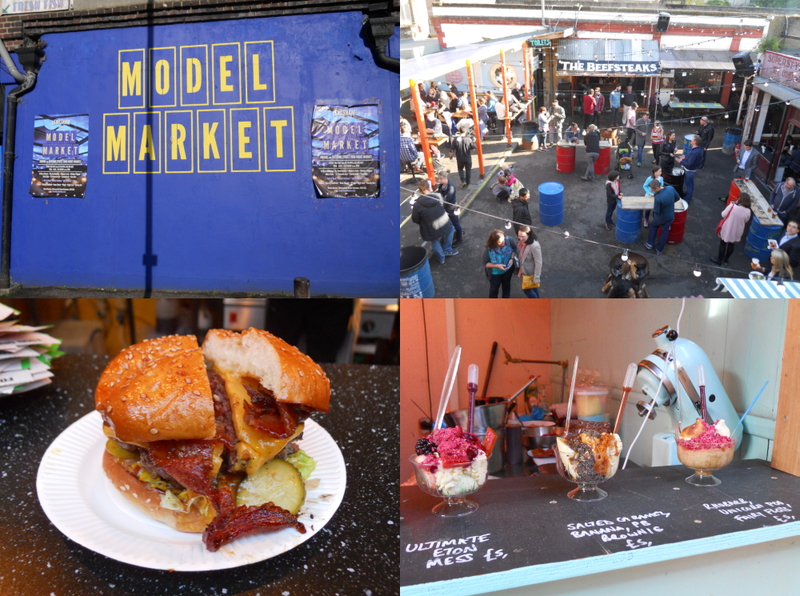 Have you been to Model Market before? What are your favourite street food stalls? Sulis & Thermae very much focuses on luxury aromatherapy inspired skincare, bath and bodycare and features a mix of well known brands such as Miller Harris and newer launches such as Arran Aromatics and Rue de Marli. Of the 4 my favourite has to be Aromaworks nurture body oil. Body oils always feel so luxurious and moisturising anyway but the blend of may chang, chamomile and sandalwood smells incredible and when used during a massage I could easily close my eyes and imagine I'm in a posh spa somewhere. There's also a mini sample of Aromaworks nourish body finish cream. A light quick absorbing body lotion which has more of an invigorating herbal smell. The Pretty Peaushun skin tight body lotion is an interesting one. It has light reflecting particles to give a subtle glow to the skin and the combination of plant extracts is designed to lift, firm, minimise bruises, ease sore muscles and even repel insects too. Now I can't say I've had much experiences with bruise and insect bites so far but it does make for a nice moisturising body lotion and the metallic pouch ideal for throwing into my travel bag. Mini fragrance samples aren't usually my thing but I like that the Miller Harris La Collection Decouverte comes with spray vials rather than little tubes which makes it so much easier to use. I've always found the brand a little overwhelming for the sheer number of scents but a sampler set like this allows me to try them in the comfort of my home. In general they're a lot smokier than my usual perfumes but my favourite so far has to be La Pluie and Terre d'iris. Have you tried anything from Sulis & Thermae before? 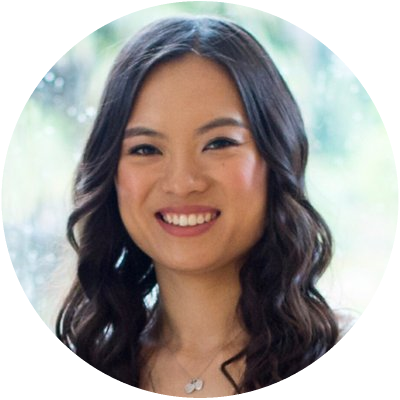 What are your favourite aromatherapy inspired products? As much as I love the beauty samples my favourite boxes are always the ones that include a little something extra, be it a lovely print or a beautiful travel bag, both of which are in this month's Glossybox. 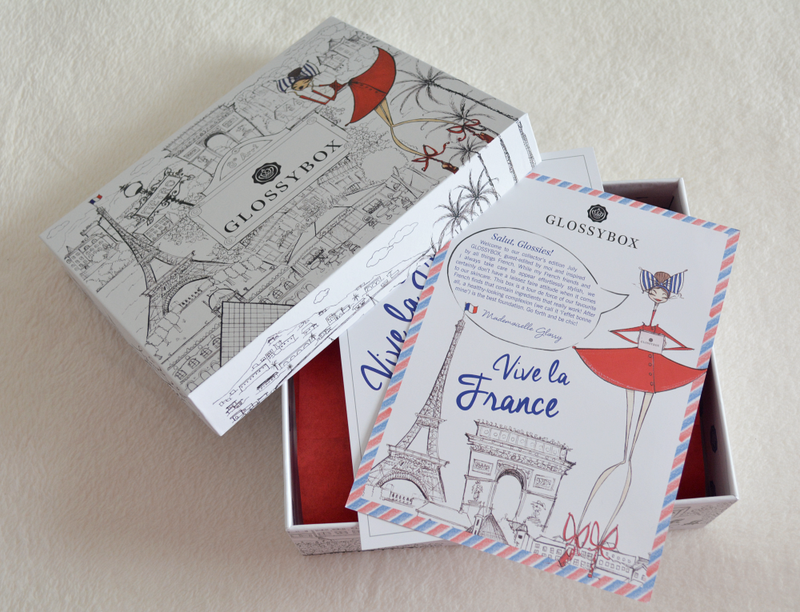 Not to mention the gorgeous Parisian inspired box itself. Recently I've been having a big clear out and throwing out a lot of the old Glossyboxes but this is one that I'll definitely be keeping for make up storage. The products themselves are very skincare focused and whilst I would have loved to see a summery nail colour or a pink lipgloss I can't really complain as they're all well chosen and can be easily incorporated into any skincare routine. I'm particularly excited about the Teoxane cosmeceuticals perfect skin refiner, a combination of hyaluronic and glycolic acid to help resurface and rehydrate the skin as you sleep at night. Vichy aqualia thermal cream is both lightweight and hydrating and the sample size perfect for taking away on holiday. You can never have too many lip balms and not only does Lollipops lip balm delicieuse smell sugary sweet, it also contains antioxidants and vitamin E to help protect against UV rays. Finally completing the set is Noxidoxi enhancing serum base, a cocktail of antioxidants and anti-inflammatories which you apply before moisturiser to help protect and hydrate the skin. French skincare is often hailed as some of the best in the world and whilst I'm not familiar with most of the brands, I'm really looking forward to giving them all a try. 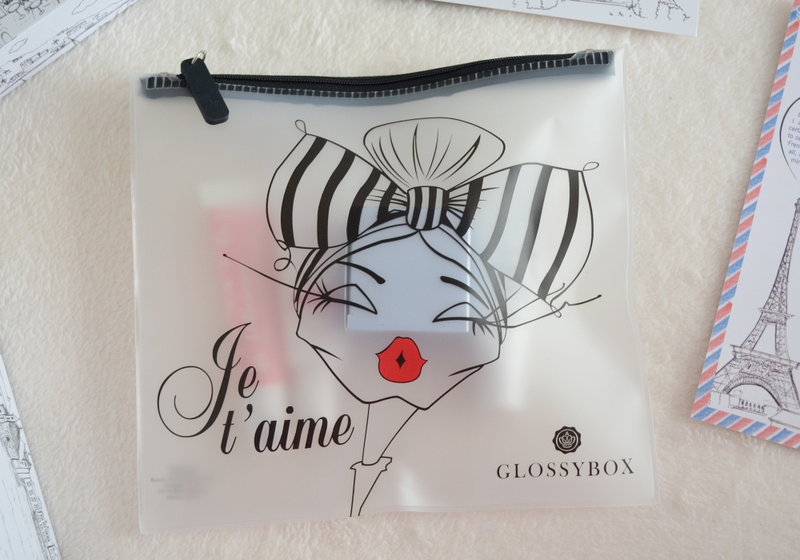 Plus the clear pouch will come in so handy for travel and I'm already planning on framing the Parisian print for my desk. Are you a Glossybox subscriber? Did you like this month's Parisian inspired theme? The entire Sachajuan range is designed to be beautifully minimalistic, yet still very practical and eye catching. I love that it comes with a pour out lid and shape makes the bottle nice and easy to hold. It's also got a lovely powdery floral scent which reminds me of the high end brands they use in fancy hair salons. 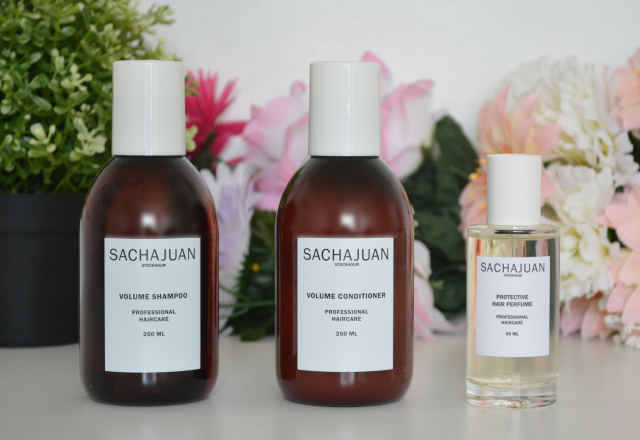 Of the 3 my favourite has to be the Sachajuan volume shampoo. It foams up easily to produce a satisfying lather, doesn't irritate my scalp, rinses away without any residue and always leaves my hair feeling bouncy and deep cleansed. The Sachajuan conditioner is very light and would be ideal if you have very fine or greasy hair. Personally I prefer something a little richer and tend to top it up every week or so with a deep conditioning mask. Completing the trio is this lovely Sachajuan hair perfume. A luxury purchase but a gorgeous scent all the same and it'll definitely make you feel extra glam for a special occasion. Have you tried anything from Sachajuan haircare? What products are you currently using?